CANTON, Michigan, January 15, 2019- Yazaki North America team members welcomed 16 students from Cornerstone Education Group’s schools in Detroit to its hospitality suite during the North American International Auto Show in January. The students from the Cornerstone Health and Technology High School toured the show before it opened to the public and heard about automotive careers from industry experts. The event was part of Yazaki’s ongoing effort to serve as a community partner in the areas where employees work and live and to empower, educate, and support the next generation of industry leaders. Founded in 1991, Cornerstone Schools is a group of five schools in metro Detroit serving 3,500 students. During their visit, students listened to presentations from industry experts and had an opportunity to walk this year’s show floor during Industry Preview Days to see the newest vehicles before it opens to the public. “The presentations were all top notch and the Yazaki technology tour was fascinating,” said Cornerstone’s Senior Development Officer, David Bologna. “The show room was exciting for our young people to experience. Yazaki and all involved are a blessing to our students, mission and our schools. 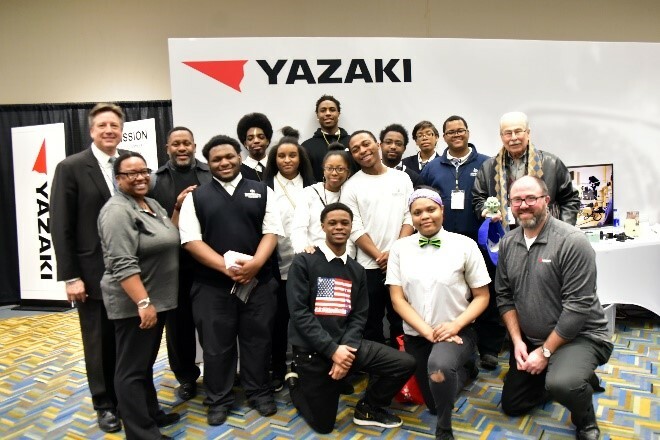 Yazaki welcomed students from Cornerstone Education Group’s schools in Detroit to its hospitality suite during the North American International Auto Show in January.